AmericanMuscle is very proud to offer Free Shipping on Everything and Same Day Shipping (on most parts) if you order by 5PM EST on a business day. We ship via UPS Ground and/or USPS to all locations in the Continental 48 States absolutely FREE regardless of weight or size. AmericanMuscle also offers Free Freight Shipping to Business Addresses in the Continental 48 States, Freight Shipments going to a residential address will require a $75 residential delivery fee. 99% of orders ship out the same day or next. Check for availability on the item page (see image to the right) as some items require additional processing time or are shipped directly from the manufacturer. Because UPS does not deliver to P.O. Boxes, we strongly recommend that you provide a physical delivery address to avoid delaying your shipment. Shipping to an APO/FPO, Alaska, Hawaii, Puerto Rico, Guam, the US Virgin Islands, or Canada is available at normal rates. If you receive a defective product please contact us within our 30 day return policy period, and we will process your return free of shipping charges. Contact rma@americanmuscle.com to process your return. If you have received a damaged or defective product in an international order placed through Bongo International, you will need to contact them by clicking the link provided in their confirmation email. 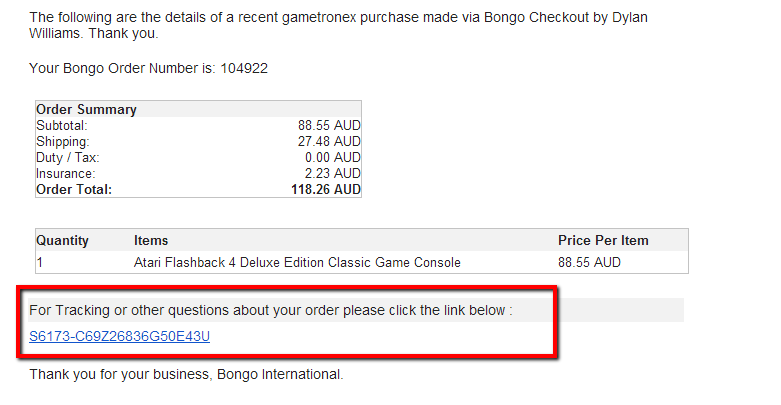 Click here for a sample confirmation email from Bongo. Receiving Your Shipment: Please be aware that it is the duty of the customer/consignee to accept delivery of freight goods consigned to them. The consignee must be present to receive the shipment at the time of delivery. Inspecting Your Shipment: It is the consignee's responsibility to inspect their shipment for damages before the UPS Freight driver leaves the delivery location. If the packaging shows any indication of damage, open it immediately to check the contents, and ask the driver to inspect the contents with you. If your shipment has been damaged, you (or the UPS Freight driver) must write a precise description of the damage on both your copy and UPS Freight's copy of the delivery receipt. If possible, please take pictures of the damages to the box and the damages to the item. Please call us so that we may start a damage claim with UPS Freight. Failure to inspect for damages at the time of delivery could result in any damage claim made thereafter being voided by UPS Freight. For Concealed Loss or Damage: As soon as possible after delivery, unpack and inspect your shipment. Should you discover a concealed loss or damage, contact us immediately to start a claim with UPS Freight. Make every attempt to leave the containers and packing materials as they were when you first discovered the loss or damage and please have pictures of the damages available to support your claim. Please note that any damage claim made after delivery has been completed could result in the claim being voided by UPS Freight. Note: The consignee is not justified in refusing a damaged shipment unless the damage has made the goods totally worthless. In cases of partial damage or loss, the customer should accept the entire shipment and determine whether it can be repaired or retained with an allowance. The customer is responsible for any holding or shipping charges on a refused shipment that UPS Freight deems repairable. The consignee must be present to receive the shipment at the time of delivery. Failure of the consignee to do so may result in a delayed delivery and possible holding of the goods by UPS Freight. If UPS Freight is unable to make delivery, storage charges for each day held will accrue. If held, these charges are the responsibility of the customer. In the event that neither UPS Freight nor AmericanMuscle.com are able to contact the customer to schedule a delivery, the goods will be returned to AmericanMuscle.com and the original and return shipping cost as well as any storage fees will be charged to the customer. A restock fee may be charged at AmericanMuscle.com?s discretion to cover any additional costs such as replacement packaging. Please note that freight items are not returnable once shipped unless as a last resort if a shipment is in danger of becoming abandoned. In the case of a Refused Freight Shipment without damage, the customer will be responsible for the original shipping, shipping of the freight item back to us, and any storage fees if applicable. In addition, the customer may be charged a restocking fee at AmericanMuscle.com's discretion based off of the individual situation and condition of the returning product and packaging. Replacement packaging needs to be special ordered so any replacement packaging for refused shipments must be covered by the customer. Free Freight Shipping: AmericanMuscle offers Free Freight Shipping to Business Addresses in the Continental 48 States via UPS Freight. A freight carrier defines a business as a commercially zoned location that has a building/office that opens and closes to the general public during normal 9-5 hours on weekdays. Therefore, please note that a business out of a home is still considered a residence. Any additional fees charged by UPS Freight for additional services either incurred through delivery issues or as requested by the consignee (other than normal shipping costs) are the responsibility of the customer. These include, but may not be limited to: Residential Delivery, Inside Delivery or Pickup, Redelivery, Limited Access Delivery or Pickup (e.g. Churches, Schools, Construction Sites and Military Bases), Lift-Gate Service, Storage Fees, Corrected Bill of Lading. Freight items can ONLY be shipped to the continental 48 states. Bongo International: We are NOT able to ship freight orders through Bongo International at this time. Inspecting Your Shipment: It is the consignee?s responsibility to inspect their shipment for damages before the UPS Freight driver leaves the delivery location. If the packaging shows any indication of damage, open it immediately to check the contents, and ask the driver to inspect the contents with you. If your shipment has been damaged, you (or the UPS Freight driver) must write a precise description of the damage on both your copy and UPS Freight's copy of the delivery receipt. Please call us so that we may start a damage claim with UPS Freight. Failure to inspect for damages at the time of delivery could result in any damage claim made thereafter being voided by UPS Freight. Free Freight Shipping: AmericanMuscle offers Free Freight Shipping to Business Addresses in the Continental 48 States via UPS Freight. Any additional fees charged by UPS Freight for additional services either incurred through delivery issues or as requested by the consignee (other than normal shipping costs) are the responsibility of the customer. These include, but may not be limited to: Residential Delivery, Inside Delivery or Pickup, Limited Access Delivery or Pickup (including Churches, Schools, Construction Sites and Military Bases), Lift-Gate Service, Storage Fees, Corrected Bill of Lading. If you have received a defective product in an international order placed through Bongo International, you will need to contact Bongo at +1 203-683-4894 or Support@BongoUS.com with your issue. If you return a product without first contacting our Returns Department at rma@americanmuscle.com for a Return Merchandise Authorization (RMA) number, it will take up to 3 weeks to be processed and we may charge you a 10% restocking fee at our discretion. If your unauthorized return has not been processed within 3 weeks, please send an email to rma@americanmuscle.com. If you wish to make a change or cancel an international order placed through Bongo International, you will need to contact Bongo at +1 203-683-4894 or Support@BongoUS.com with your request. By accepting the Terms and Conditions, you will be opted in to receive AmericanMuscle marketing messages at the email address provided. If at any time you wish to stop receiving these marketing messages, please use the unsubscribe feature at the bottom of each email.